Powered by GX690 (688 cc), air-cooled Honda gasoline engine, MP 315 incorporates heavy-duty drive train, standard-duty gearboxes, and two 46 in. dia, 4-blade, non-overlapping rotors. Frame facilitates servicing, and torque converter clutch gives operator full variable speed control of rotors to 145 rpm. In addition to manual steering and blade pitch controls, rider features 4 lights, 12 V charger, and electric powered spray system for application of retardant. 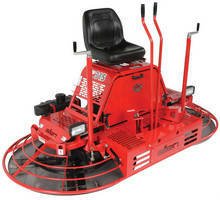 The Allen MP 315 is a total re-design of the MP 305 Mechanical Drive Riding Trowel. The MP 315 is an entry level riding trowel with the features found in our larger riders. The higher horsepower gasoline engine and heavy-duty drive train is packed in an easy-to-service frame. The Standard-Duty Gearboxes and four-bladed rotors are proven performers in the field. The MP 315 is now equipped with a Torque Converter Clutch which gives the operator full variable speed control of the rotors. The MP 315 is one of the latest additions to Allen's Mechanical Pro (MP) Series of Riders being launched for 2011. You can see the MP 315 rider as well as the entire Allen Equipment offering in Booth #O30621 (outside in the silver lot) at World of Concrete 2011 in Las Vegas, Nevada.